Young Living’s Organic Dried Wolfberries are a sweet, organic snack from nature that’s easy to make a part of your daily diet. Our gentle drying process makes these USDA-certified organic wolfberries versatile and easy to incorporate into lots of recipes, letting you add wolfberry benefits to anything from stir-fry to baked goods. You can even take a handful and pop in your mouth for a quick snack! Young Living’s Organic Dried Wolfberries are a sweet, organic snack from nature that’s easy to make a part of your daily diet. Especially because our gentle drying process makes these USDA-certified organic wolfberries versatile. They are easy to incorporate into lots of recipes. Therefore, letting you add wolfberry benefits to anything from stir-fry to baked goods! With polyphenols and polysaccharides, this exotic berry is touted around the world for its taste and nutrients. 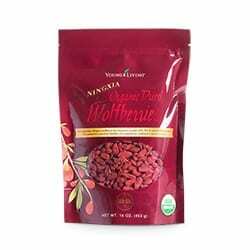 Furthermore, documented use of wolfberries dates back to the Ming Dynasty. This is where they were part of ancient Chinese culture. Top yogurt or a smoothie with wolfberries for a wholesome breakfast with a satisfying texture. Include Organic Dried Wolfberries in your homemade granola or trail mix for a nourishing snack on a hike, at school, or around the home. Add to your favorite muffin, pancake, or bread recipes. Toss with leafy greens, shaved or crumbled cheese, and vinaigrette for an exotic gourmet salad. • Wolfberry Tea. Bring 8 ounces of water to a rolling boil, let cool for 3 ½ minutes. Line bottom of cup or mug with dried wolfberries and add water. Steep for 5 minutes and stir before drinking. Wolfberries can also be added to your Slique Tea for a nice flavor twist. Once you have finished your tea, don’t forget to enjoy the hydrated wolfberries!